There’s no doubt you won’t be able to relax in the clothes from this year’s resort collections. All designers came up with comfy clothes which can easily be mixed and matched. It was all about airy fabrics, floor-sweeping designs and lots of accessories to finish the looks. And though showing your tummy is never very classy, this summer walking around in a hight waisted pair of pants and a bandeau top is the style. In May Karl Lagerfeld was the first to show his resort collection for Chanel. He turned the presentation into a big fashion event held in Saint-Tropez. All of his supermodels were there, including Georgia May Jagger en Crystal Renn. They wore flirty designs with colorful stripes (some red, pink, yellow and blue), ruffles, lace and embellishments. With knee boots, hats, large sunglasses and waistbelts Chanel provided everything for the jet-set life. With DVF’s new resort collection you could hit the beach some thirty days in a row and look splendid every time. There were so many good outfits to chill in; no wonder the models couldn’t keep their eyes off themselves in the mirror. DVF’s look were flirty and feminine and were 90 percent printed. Most lovely were her rompers and high-waisted shorts combined with blouses and jackets. Elbaz’ clothes for Lanvin existed of much more fabric than those of the previous two brands. His models were fully dressed up in their trench coats, skirt suits and column gowns. We felt they could better be having tea with their friends on a nice terrace, instead of strolling around the beach in those luxurious looks. Still, the bathing suits, small sunglasses and swimming caps were supposed to give us a beach-feeling. The Lanvin resort girls looked nice, but the presentation didn’t breathe the relax feeling we love so much about resort collections. The LV resort collection was no surprise. Like in his Ready to Wear show Marc Jacobs worked the curvy fifties/sixties look. The floral prints, though, were a bit more colorful and seemed more appropriate for summer. Oversize chain necklaces, leather driving gloves, and bold, floppy hats— completed the LV summer feeling. Jacobs own line was all about (Chanel-like) tweed jackets and pastel colors. Some outfits had lots of fuss like embroideries and flowers, while others were more minimalistic and streamlined. His own travelling places were the inspiration of Kors’ resort collection. Therefore not all looks felt like summer. Instead, thick grey capes, long knitted sweaters and fur hats seemed more appropriate for a trip to Russia than a holiday on some tropical resort. Yet there were a few summer dresses and bathing suits too. There must be; Kors was on at least 35 business trips last year. His main resort colors were grey with a splash of peach. 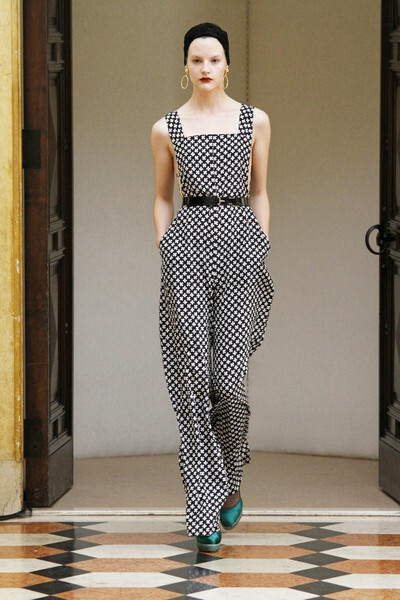 Beautiful summer dresses and long evening gowns, that was what de la Renta’s resort collection was all about. There was no sign of the present minimalistic trend here. Oscar heavily embellished his designs with beads, ruffles, bows, layers and pleats. His floor sweeping evening gowns are maybe not so handy to pack, but they sure were perfection. Stella McCartney didn’t give a one-way presentation. She let the models and the audience interact and in that way let her collection come to live. She gave us lace shorts, A-line dresses and tulip-shaped skirts and thus it was a all about showing the legs at McCartney. Stefano Pilati gave us some seventies for YSL. High-waisted trousers and sophisticated dresses. He used some black and white and a bit of pink and lilac. His long pants with bandeau top looked very elegant and the models’ classy headbands perfectly matched with that.